Scroll down for the #custserv conversation report for October 11th, 2018 EST. When it comes to participants, we ranked 16th among 521 conversations. In terms of the number of posts, we ranked 16th out of 521 conversations that took place. This conversation ranked 18th out of 521 in terms of the amplification of ideas & content. 7% of participants in this conversation engaged each other 16 times. #refresh18 Paying customers in 150 companies. Many new #CRM users, with a concentration of #custserv Freshdesk users. @kateleggett @forrester The immediacy and directness of the #custserv approach lowers the barriers to successful and appropriate sales. Love your tool and LOVE ❤️ your excellent #custserv Rock on @Buffer . Today’s banking customers want personalized interactions, simplified banking and access to their accounts through technology. Banks that can innovate and meet customers’ needs have a huge competitive advantage. Here are 10 examples of innovative banking customer experiences. 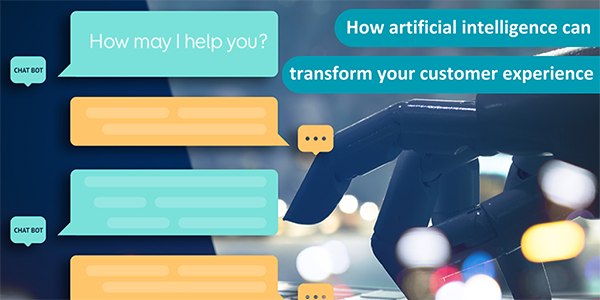 How artificial intelligence can transform your customer experience | Eptica - Multi Channel Customer Interaction Software. Email Management. Web Self-service. Live Chat and Agent Knowledgebase. When interacting with brands, consumers want the process to be easy, effective and based on an understanding of their emotions and the individual needs. They want a personalized service – and their expectations are continually growing.